Posted by Jan Vantomme on 16 May 2009. Moving from Processing to iPhone development is hard. The OpenGL implementation is a little different and there is little documentation available. I’ve learned a lot by reading Beginning iPhone Development by Dave Mark and Jeff Lamarche and the iPhone Development blog. In these articles I want to share some of the things I’ve learned. Read this article as an introduction to Generative Design on the iPhone. So let’s do some OpenGL programming. Create a new project using the OpenGL ES Application template and save your project with the name openglcircle. Make sure you use the “UIStatusBarHidden trick”:http://vormplus.be/weging/how-to-create-a-fullscreen-iphone-application/ to hide the status bar and get a true fullscreen application. Add a file with the name Constants.h to your project. This file is going to hold some handy functions that are used a lot in generative design. One to convert degrees to radians and one to generate a random float between two numbers. Add the following lines of code to this file. Open openglcircleAppDelegate.m and change the animationInterval to 1.0 / 2.0 so the view will only update twice a second. You can change this back later when the project is finished. But you’ll need a slow speed now to see what happens on the screen. Open EAGLView.m and add an import statement for the Constants.h file. Next up is deleting the code in the drawView method to do your own custom drawing. Leave these lines of code in there so you won’t have to type them all over again. To draw a nice looking circle you’ll need to define 360 points on the perimeter of the circle. For each of those points you’ll need an x and y value so you’ll will need to calculate 720 values. To do this you’ll need an empty GLfloat array with a length of 720. See the line of code below. Next up is filling the array with the right x and y values for the points on the perimeter of the “unit circle”:http://en.wikipedia.org/wiki/Unit_circle. To draw the circle you need to tell OpenGL what array of vertices to use. This can be done with the glVertexPointer() method. You’ll also have to use the glEnableClientState() method to enable the use of vertex arrays. 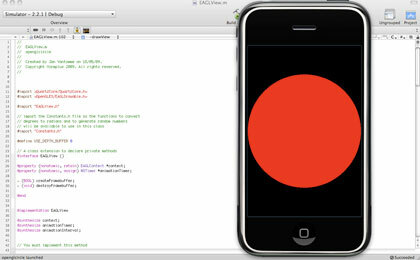 Before you can draw the circle, OpenGL needs to know what color to use. In Processing you would use the fill() function. In OpenGL you can set this color with the glColor4f() method. This method takes 4 color parameters just like glClearColor(). The line below will set the fill color to red. And finally you can draw the circle with the glDrawArrays() method. If you run the application in the iPhone Simulator and everything goes ok, your application will look like this. You can download the project files for this tutorial right here: openglcircle.zip (XCode project with sample code to draw a circle in OpenGL ES.). In part two of this article I’ll show you how to draw a better circle by changing some little things. Thanks for noticing the little bug. I’ll keep it in mind when I’m posting the second part of the tutorial later this evening. I took the freedom to reformat your code example to fit with the rest of the blog.